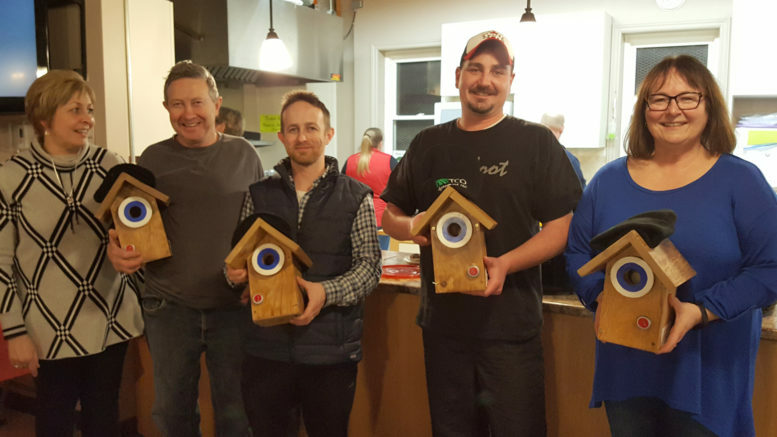 Sandra O’Neill of TCO Agromart presents curling themed bird houses to the winning team of David VanVlack, Andrew VanVlack, Darren Kells and Jordan VanVlack. Submitted photo. NDCC’s TCO Agromart Farmers and Friends Open bonspiel was once again very popular thanks to convenors Jim Stapley and Pam Jordan with scorekeeper Daryl Lalonde. The overall winner this year was Napanee’s Van Vlack team consisting of Dave, Jordan, Andrew and Darren Kells. As the three game winner on Draw A, Dave’s team bested the three game winner of Draw B in a dramatic four rock shootout. The winner of Draw B and second overall was the very happy Gayle Johnson team. Playing with Gayle was Louise Van Heighten, Donna Poirier and husband Guy Johnson. Third and fourth place teams were Vic Mathews of RKCC and Andy Palmer of NDCC. It was a tough field of teams. Local teams enjoyed playing teams coming from Quinte, Royal Kingston, Trenton and Picton. A big thank you to Terry and Sandra O’Neil of TCO Agromart for making this bonspiel a very popular event. Sandra worked many hours gathering prizes so everyone went home with a prize, all 64 players. Stapley ended his presentations by thanking all the local businesses and club members who contributed including Linda Yorke who ensured all four event winners went home with a handcrafted bird house. Stapley and Jordan along with the 64 curlers gave a big round of applause to the many volunteers who worked the kitchen, the bar and the ice. Up next is the club’s popular annual Ladies InClub Funspiel on Sunday followed by Paint Nite on Feb 16, Mixed Doubles is Feb. 17 and Family Day Feb. 18. The Highland Lassie is on Saturday, Feb. 23 followed by the next Progressive Eucre on Feb. 24.